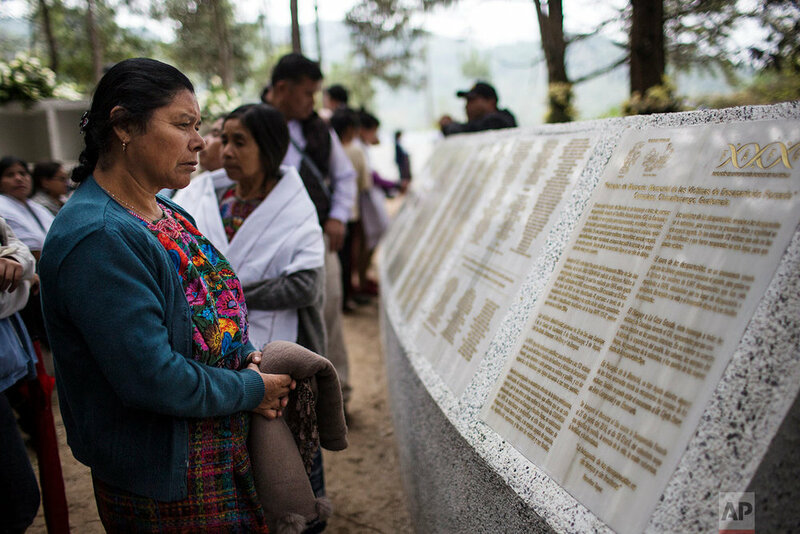 In this small rural town, the anonymous remains of some of the tens of thousands who disappeared during Guatemala's long and bloody civil war can finally rest in peace. Women from the village of San Juan Comalapa, about 50 miles (80 kilometers) west of Guatemala City, spent years saving money and raising donations to buy a plot of land where an army camp once stood. During the 1960-1996 conflict, people from across the country were abducted and brought here by soldiers, then were tortured, killed and buried in mass graves. Since 2003, forensic anthropologists have dug up at least 220 individual remains in the town, but only about a quarter of those could be matched to relatives. Those bones that could not be identified have now been interred at the forest location of the former camp, with three of the mass graves left open in a nod to historical memory. 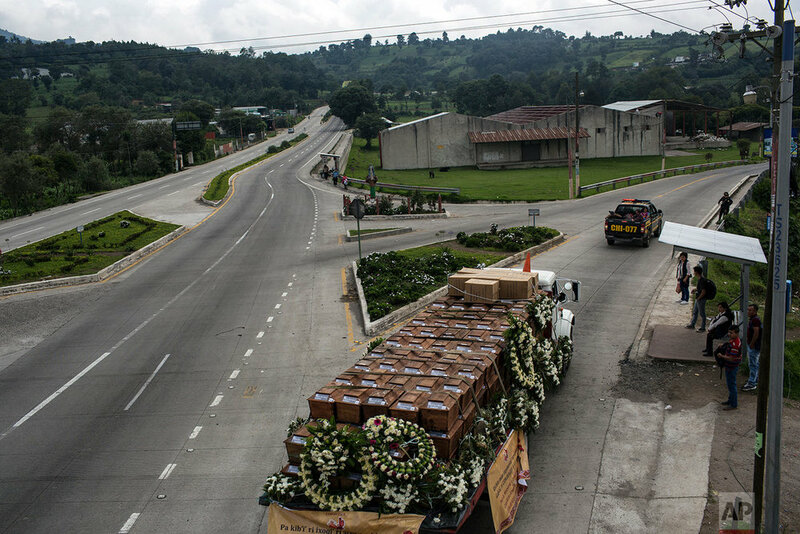 On a recent day a truck rolled past with 172 coffins strapped to the flatbed. They were smaller than normal coffins, containing just collections of bones rather than whole skeletons. Women in colorful embroidered skirts and white shawls carried bouquets of flowers in a solemn procession behind the truck. 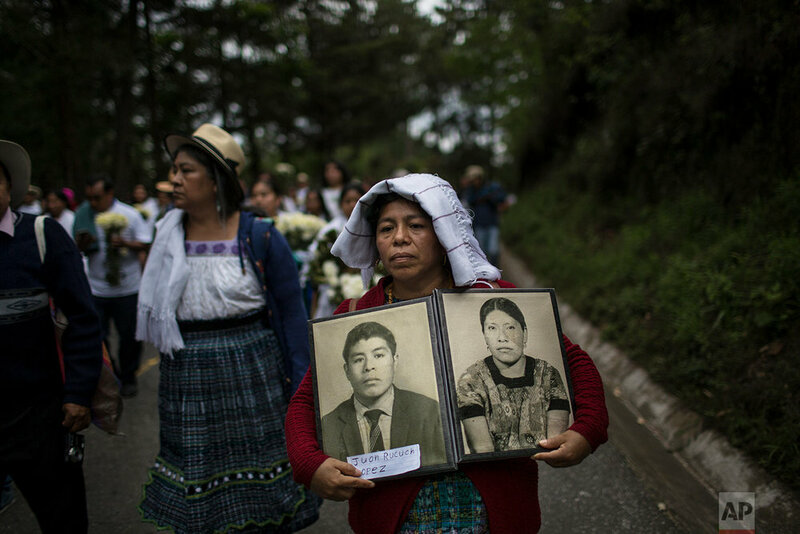 Marivel Yolanda Rucuch held aloft portraits of her father, Juan Rucuch, and aunt, Virgilia Quina, who disappeared decades ago, allegedly at the hands of soldiers. Prudencia Machan, whose daughter went missing in 1981, wept profusely, deepening the wrinkles on her 76-year-old face. 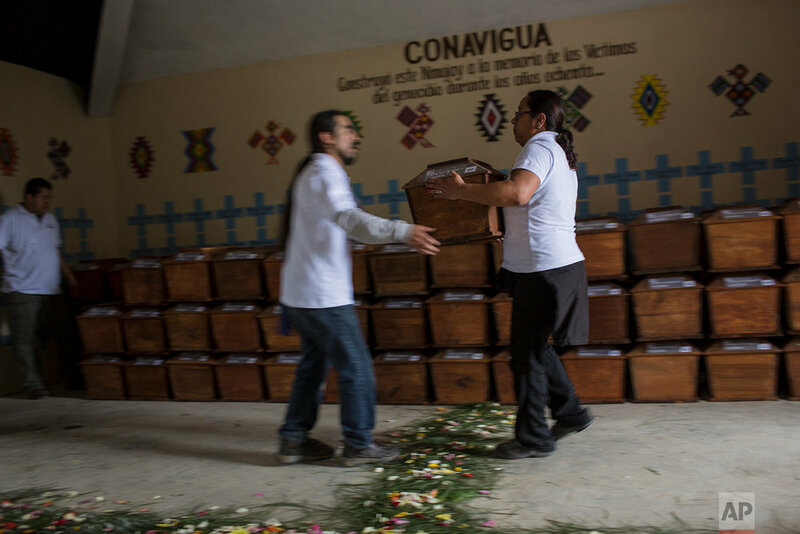 The previous night, in the center of town, women had put grass and flower petals on the cement floor of a community center as they blessed the coffins with prayers and incense. At the final resting place, surrounded by lush trees and brush, lies a home — or "nimajay" in the Kakchikel indigenous language — where painted blue crosses adorn the wall. Next to the mausoleum lies a granite plaque engraved with names of the missing. Colorful murals tell the story of what happened here, as revealed to the women in dreams and interpreted by artists hired to give their visions form. It is through art that "we can reclaim the victims' existence" and educate young people born after the war, said Uriela Cumes, one of the Kakchikel artists involved in the project. Text from the AP news story, AP PHOTOS: Anonymous bones of civil war dead laid to rest, by Sonia Perez.